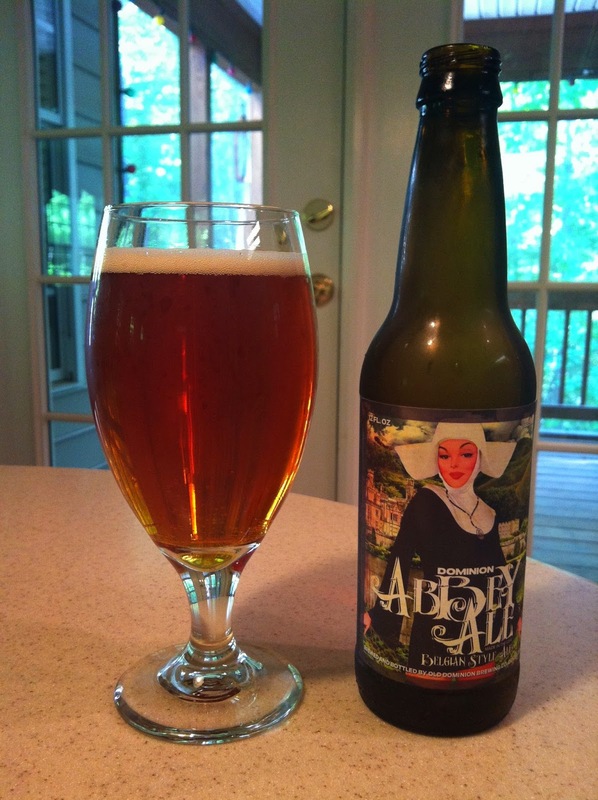 Abbey Ale is the latest release in the Dominion Brewing "Pinup Series." The slightly irreverent artwork actually has some basis in history. It was a Benedictine nun, Hildegard von Bingen (1098 - 1179), the Abbess of Diessenberg, who first wrote about the preservative powers of hops in beer. I shared the sample bottle with Colleen this weekend; after all it was Mother's Day. The Dubbel-style beer pours a deep copper color with a thin off-white head. The aroma is yeast and caramel. The flavor brings in caramel, butterscotch, banana, and a hint of dark fruit. A touch spiciness comes through at end. The finish leaves behind a mild sweetness while a moderate carbonation tingles the mouth. The 7.5% ABV adds just a touch of detectable warmth, but the overall profile is quite smooth. We both enjoyed the Abbey Ale. It was a delightful late afternoon "appetizer" on a relaxing Mother's Day. Splitting the 12 ounce bottle left plenty of room for dinner, dessert and drinks to come later. Abbey Ale replaces Candi Belgian Tripel in Dominion's Pinup variety pack and will also be available on draft in the mid-Atlantic states. Your typical (though mild) Belgian spicy yeast, white pepper tingle.